we can see that the line is more jagged and in the case of breast cancer pretty consistent. If my own personal experience is worth anything, most of the people around me that had cancer are dead. I don’t need the statistics to know that my experience with losing loved ones to cancer hasn’t changed for my entire life. When my grandmother passed away, my memory of that experience was a young doctor that barely spoke english telling us “What are we to do? She is old.” Last year my father in law passed away from cancer and I am convinced that the treatment was worse than the cancer itself. What we are doing as a society is making ourselves sicker and we don’t have the tools to counter our technologies ill health effects. It always amazed me that our government makes us wear seatbelts in the car. Think about it, you can wear a seatbelt and smoke a cigarette. So the government is worried about your immediate demise upon impact in a crash over your long term suffering and likely painful death associated with smoking. There is a chance that you won’t ever get cancer or any of the related smoking illness but there is also a good chance that you won’t hit something with your car or be hit. It is all nonsense. Both wearing seatbelts and smoking is good for reeling in money. As soon as big government starts to get momentum around smoking weed that will become legal across the US as well. Why? Because the big claims around health impacts are squashed by the desire for cash. Until we wake up from our ignorant slumber on how we are destroying everything and everyone around us in the name of being connected and knowing stuff, we are potentially doomed in our time. As long as someone else is dying, we don’t worry about anything. It will be enough when it is too late. 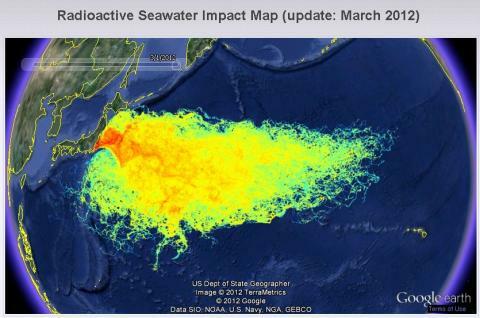 Here is a nice little picture of the radiation in our ocean from our friends in Japan. **Rant Over** Thinking of you today Dan ..